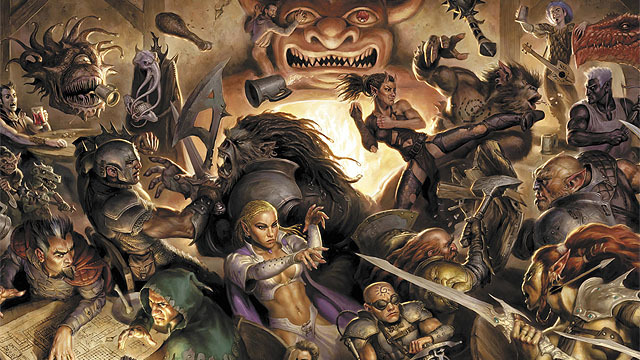 It’s been a long time coming, but the 5th Edition of the iconic Dungeons & Dragons tabletop roleplaying game is finally here. I’ve reviewed a module set on here in the past, Against the Slave Lords, but that was just a collection of adventures. This release includes the basic rules (which are available for free online right here to everyone) the starter guide, and an introductory campaign to get players started and up to level 5. 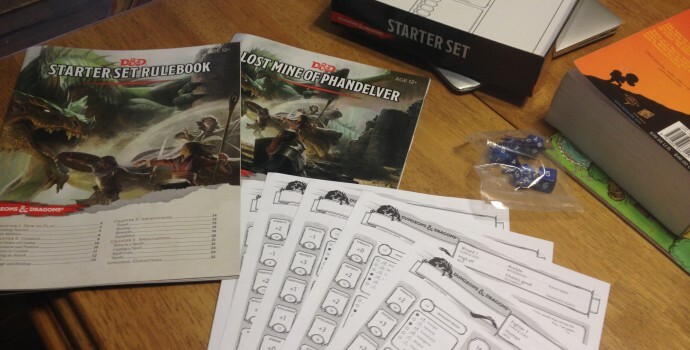 This review will not cover the specific details and plot points of the included campaign, Lost Mine of Phandelver, in order to avoid spoilers. However, it will reference elements of the campaign and use examples to demonstrate concepts. The focus of this review will be on the changes made for this new edition of D&D and how the mechanics play out. That’s it. No maps, no tokens or minis, no beefy guides, none of that. With a smartphone dice app, you don’t even really need a table to play this edition. However, don’t let the box’s lack of weight fool you – Wizards of the Coast has crafted a much more open-ended experience with this version. 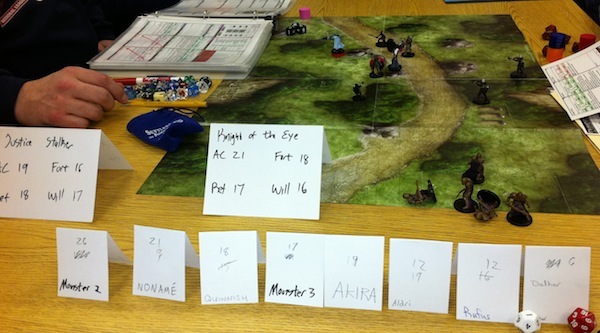 A game of 5E D&D might not look anything like this. Essentially everything has now been boiled down to your ability modifiers, creating a much more fluid and streamlined process. Advantages and disadvantages are a great new idea. Instead of having to remember a huge list of different effects and consequences for situations and actions, the advantage or disadvantage system is an elegant solution for so many instances. If your character has advantage, you roll 2d20 and take the higher number, if disadvantaged, you instead take the lowest number. It’s a great idea that adds just a bit more unpredictability to the game and cuts down on the amount of +’s and -‘s getting thrown around during games – always a good thing. You no longer need a physical map and grid to enjoy the game – campaigns will be designed to be enjoyed with or without them. This means a heavier emphasis on improvisation and providing detail for actions. The map-less method is described as the “Theater of the Mind” technique, which is described in more detail below. Gone are the likes of At-Will, Encounter, and Daily powers. Now, every class just has different things that they are good at. For example, Rogues develop the ability to easily sneak and hide to gain sneak attack damage and even half the damage received from enemies that are visible. Fighters gain extra attacks. Clerics and Wizards get robust spellbooks. Instead of each class being structured similarly, they all have different quirks that make them unique. 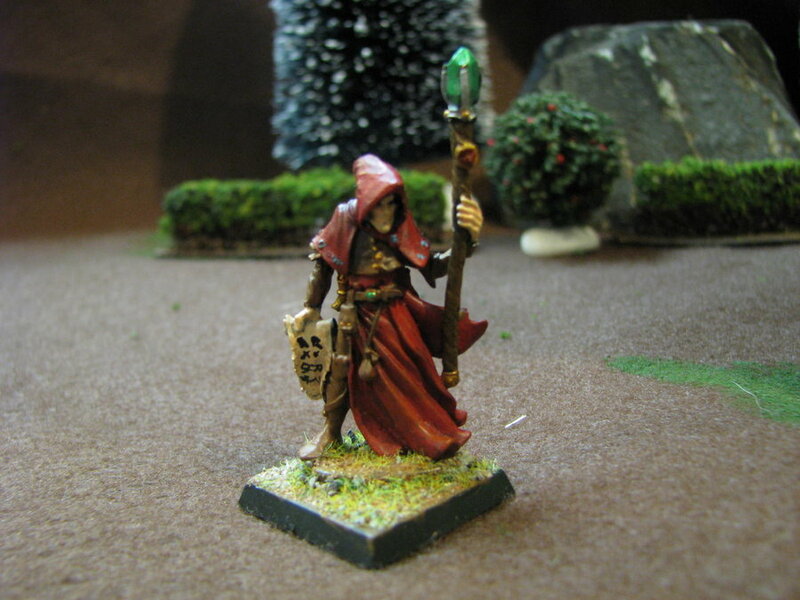 I’ll go over the Starter Set classes specifically near the end of the review. What I picture in my head while running D&D games. Now that you’ve had a primer on the new bits and bobs, let’s go ahead and dig into what playing the new edition is really like. Honestly, it’s as simple as cracking open the guides, reading over the basics, and getting started. 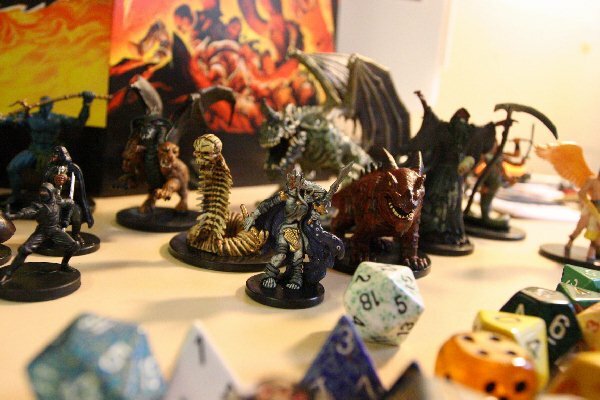 If you have absolutely zero experience with D&D or tabletop gaming, then it will probably be an uphills struggle for you to really grasp the mechanics, but they’ve made it more accessible than previous iterations. Regardless, it’s still best played with at the very least an experienced DM. The root of the game remains the same – the DM guides the narrative and controls all non-player character aspects and the players make choices and contribute to the game in order to try and progress. Of course, every DM and player are different, so even if you were to run the exact same campaign as me, you’d probably have drastically different results. The best thing about D&D has always been the opportunities for improvisation. As a player, it’s an exhilarating feeling of accomplishment and triumph when you finally overcome major challenges and receive rewards. As a DM, it’s observing the completely unique and unpredictable solutions that players inevitably come up with to overcome the puzzles you’ve created for them. No matter how clever you think you are, players always seem to come up with something you just never really thought about. Ultimately, that’s the essence of D&D and it’s in full force with 5th edition. The biggest change for this version isn’t really with the core mechanics – although there are plenty of changes there as well – but it’s with how the game is fundamentally approached. 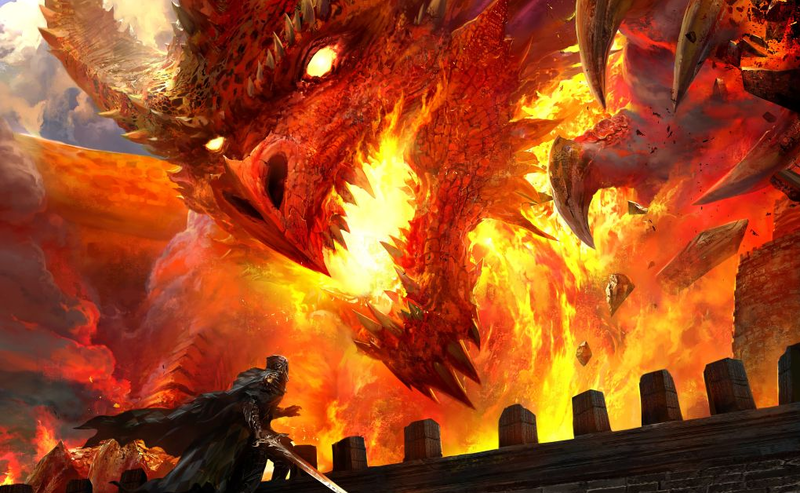 D&D’s 4th edition was very much like a video game broken down into pieces that could fit into a tabletop game’s structure. Characters had different types of abilities, there were maps and grids to move around, things had much more structure and definition to them. As a result though, it was much more limiting and often confusing with so many systems at work. Every D&D player imagines the most epic moments for the most minuscule of battles. This edition gets rid of a lot of hindrances though, instead allowing for creativity. You don’t even need a map to enjoy combat in this version, as the game could potentially be played entirely through the utilization of the “Theater of the Mind” concept, or just using your imagination. Rather than drawing out grids and calculating your movements on each and every turn, just describe to the DM what’s going on. Is that goblin on the far side of the room? Well, you probably can’t reach him in one turn, but you could move closer and throw a javelin as you approach, or try to get his attention and prepare a strike as he approaches. This forum post does a great job of explaining how Theater of the Mind works for D&D 5th edition. Essentially, you want to make sure that as players and as a DM, you are being as descriptive as possible, but don’t get caught up on details. You don’t need to worry about saying how many steps you take, how many feet you moved, or anything like that – keep it on a need-to-know basis. DM’s should be generous in their interpretation and take the player’s intent into consideration. This is probably way cooler than your mini will ever be. From my knowledge and background, I can definitely say that this latest edition of D&D is very easy for new players to pick up and play. It strikes a strong balance between the more structured systems of 4th edition, while still allowing for lots of imaginative solutions as previous editions were known for over the years. The Starter Set does a good job of giving you what you need to get started with your first adventure, I don’t know if I would necessarily recommend trying to play without any prior experience at all. While you may receive all that you absolutely need, it is far from ideal. New players to tabletop gaming enjoy having visuals to go along with the game itself, so minis (or at least tokens) places on maps are strong support devices for combat. The art of verbal roleplaying, acting out characters, and improvising situations can also be extremely difficult if you’re brand new to the experience. Dungeons & Dragons 5th edition is easily one of the most approachable versions of this game ever made, but it still requires that you at least play with a DM that has a bit of prior experience to provide that additional guidance needed to really enjoy the game as it was meant to be played. 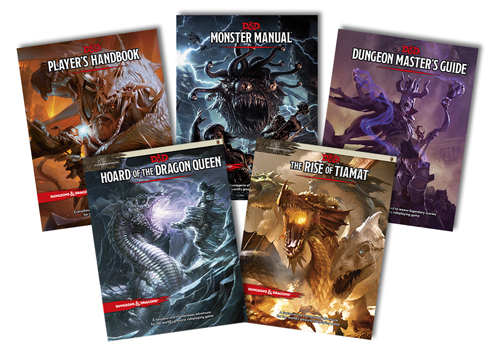 With the D&D Starter Set, you could be well on your way to grand adventures. Overall, I adore the 5th edition of Dungeons & Dragons and the Starter Set is an absolutely excellent starting point. The future looks quite bright, with several releases on the horizon soon to come. This Starter Set provides you with the bare bones framework needed to hit the ground running, while allowing for plenty of customization as you get more experienced. If you have any questions or trouble with the game, or just want a great place to consult for resources, I highly recommend checking out the subreddit for 5th edition over on Reddit, as it provides tons of great advice and links. These books will be released over the next few months to further flesh out the latest edition. Have you tried out the latest edition of D&D yet? If so, what did you think? Let us know down in the comments below! This review is based on a review unit of the Dungeons & Dragons 5th Edition Starter Set provided directly by Wizards of the Coast.